No other words are needed to describe this enchanting, majestic part of the world. Any other descriptive prose has already been written, far better than we ever could. Last week we took a trip to Italy to explore some of the handmade products they are so renowned for and to gather inspiration for product development. It was also a great opportunity to take some photos to share on our site as well as further test our products. We believe continual testing is invaluable and must be done in order to know how to improve them going forward. The below images were taken with the Nikon D750. However, we brought the very capable Fujifilm X100T along with us for those moments when we wanted to be as discreet as possible. Those images we kept to ourselves as they were the more candid photos we took on our trip. Although, the one image we did post that was taken with the X100T is the photo of the bike below. 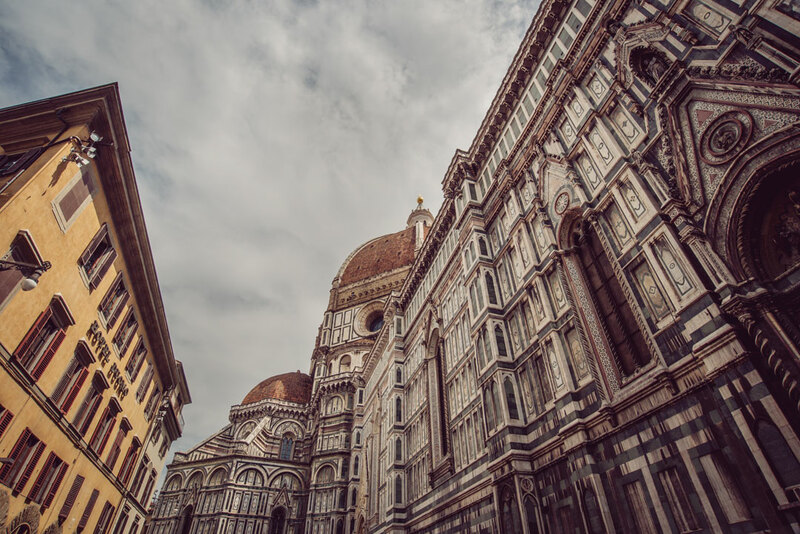 The Cattedrale di Santa Maria del Fiore, or Florence Cathedral. Building began in 1296 in the Gothic style. It is positively one of the most striking buildings on Earth. Details: Nikon D750, Nikon 18-35mm G lens, B+W F-Pro Circular Polarizer. Exif: ISO 200, f16, 1/125 sec. Photographing the beautiful Fujifilm X100T with our brown Oxford leather camera strap. Details: Nikon D750, Nikon 18-35mm G lens, B+W F-Pro Circular Polarizer. Exif: ISO 500, f16, 1/125 sec. The Fujifilm X100T is one of the most well-rounded cameras we’ve ever used. It is what it is. And that is a compact, extremely versatile, sharp camera. It was never supposed to be a DSLR killer. But when you want a stealthy, good looking camera that produces fantastic images, you can’t go wrong with it. Plus there are loads of accessories for it, including thumb grips and hoods. We love the look of it with our Kensington leather camera strap, as well as our Oxford leather camera wrist strap. They just go really well together. This is not a review of the X100T. It is simply our thoughts on it based on how it functioned during our trip. There are no technical details here, just a couple of photos of it looking every bit as well constructed as it is in real life. 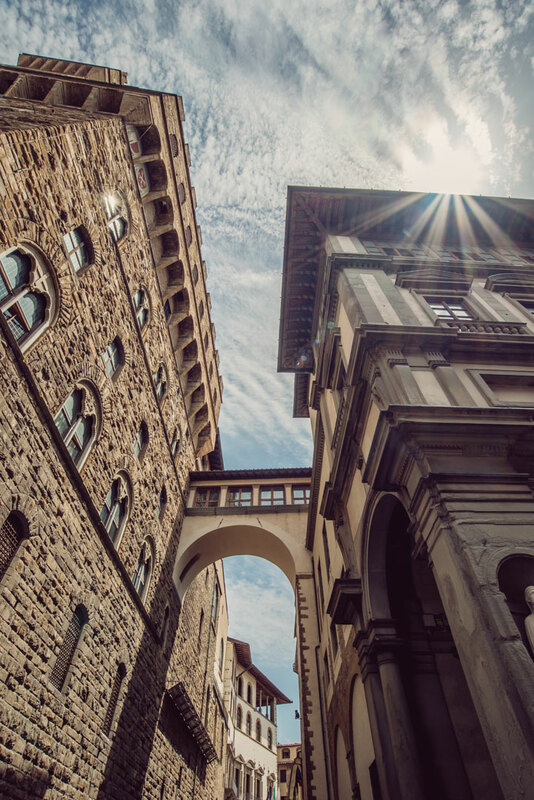 The Vasari Corridor connects the Uffizi Gallery to the Palazzo Vecchio. 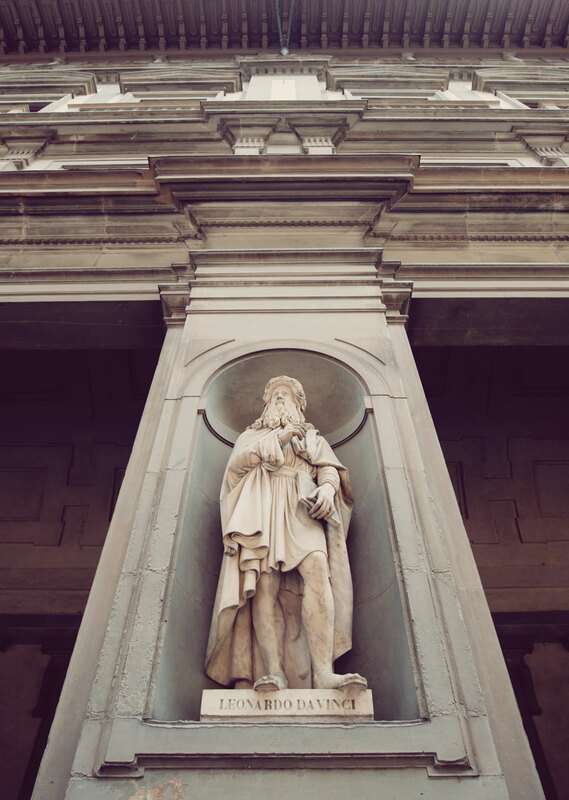 It was built in only five months during 1565 and is one of the main reasons tourists need to look up more in Florence. Details: Nikon D750, Nikon 18-35mm G lens, B+W F-Pro Circular Polarizer. Exif: ISO 200, f16, 1/160 sec. If you can’t get inspired by looking at the master himself, nothing can inspire you! The Torre del Mangia was built between 1338-1348. 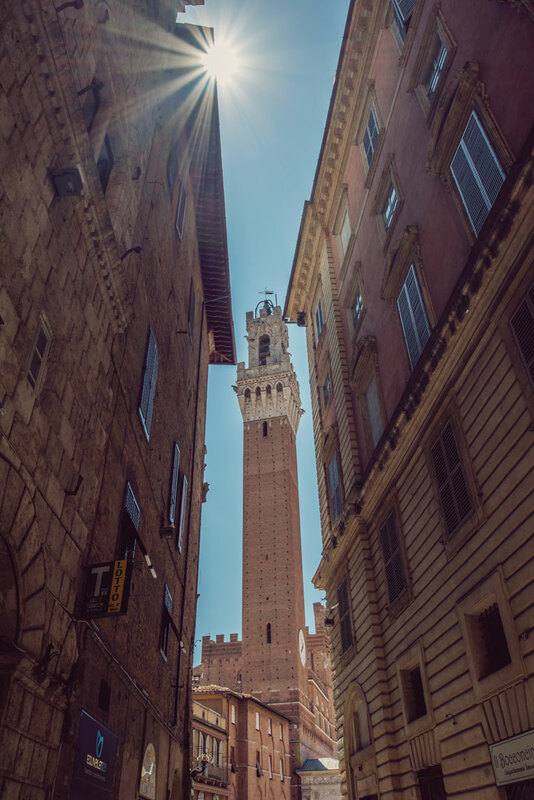 It is located centrally in the Piazza del Campo, Siena, one of Italy’s most famous squares. At 88m high it is also one of the best places to admire the views of Tuscany. Details: Nikon D750, Nikon 18-35mm G lens, B+W F-Pro Circular Polarizer. Exif: ISO 450, f16, 1/125 sec. What would a trip to Italy be without coffee? And what better place to enjoy one than at Agribar Eroica Caffe? This cyclist haunt is one of the only cafes on the official Eroica route. It is also one of the best cafes for vintage cycling memorabilia. Here the striking Fujifilm X100T sits with our brown Oxford leather camera strap. What a perfect little camera this is. Just the right size to take with you anywhere. 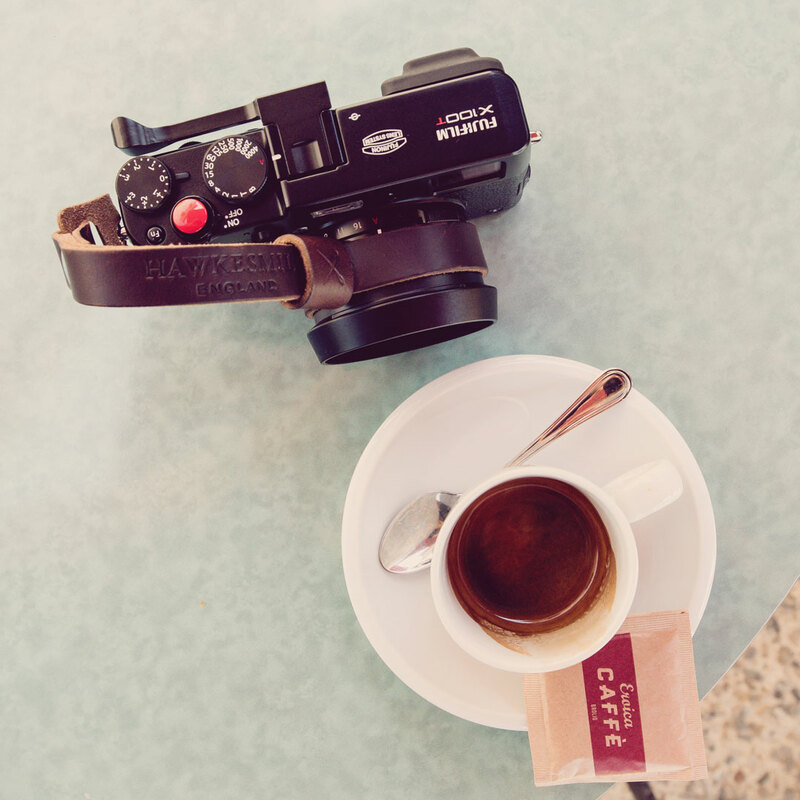 Obviously Fujifilm drew inspiration from Leica, but we think that’s great. Fujifilm has made a truly classic camera in the X100T. If you are just starting out in photography, shoot a lot of street photography, or like to be discreet, this camera will not disappoint. Of course, you could also opt for the newer and more expensive Fujifilm X100F, which we’ve heard amazing things about. Details: Nikon D750, Nikon 18-35mm G lens, B+W F-Pro Circular Polarizer. Exif: ISO 1250, f8, 1/125 sec. 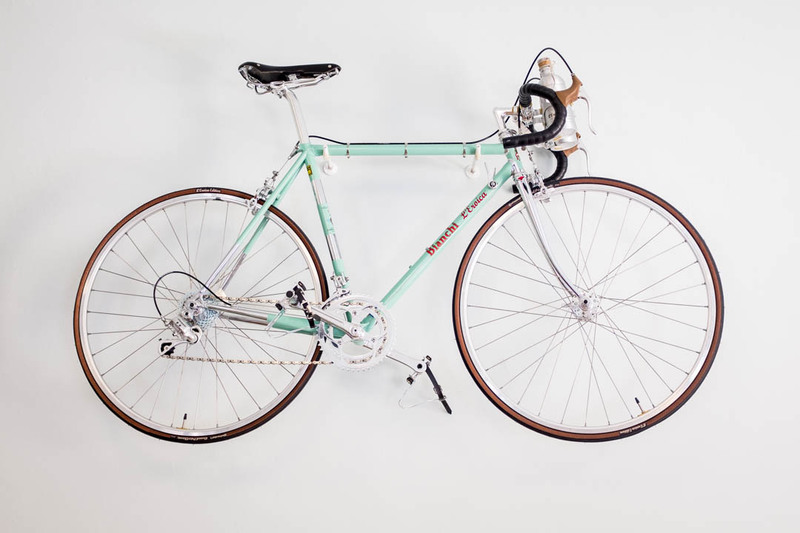 A beautiful Bianchi bike hanging on the wall at Agribar Eroica Caffe. A reminder that newer technology doesn’t always mean better, or more beautiful. We completely agree. In fact, our favourite camera of all time is the legendary Nikon D700. An almost perfect machine, even at 9 years old. The realness captured by the sensor adds depth and likeness that is often lost on newer, more “perfect” digital cameras. We believe it has an almost film quality to it, due to that glorious sensor and the fact that it isn’t perfect, just like the analog world. Details: Fujifilm X100T. Exif: ISO 400, f2, 1/80 sec. The L’Eroica is an inspiration to us here at Hawkesmill. Founded by Giancarlo Brocci in 1997 as a means of reconnecting cyclists to the passion of a bygone age. The L’Eroica began in Italy, but has since spread and there are now Eroica events held in California, South Africa, Japan, Spain, France, South America and two events in Italy, as well as our favourite, the Eroica Brittania. A cycling event perfectly matched with our brand, including tweed and other handmade, quality products, constructed the old fashioned way. 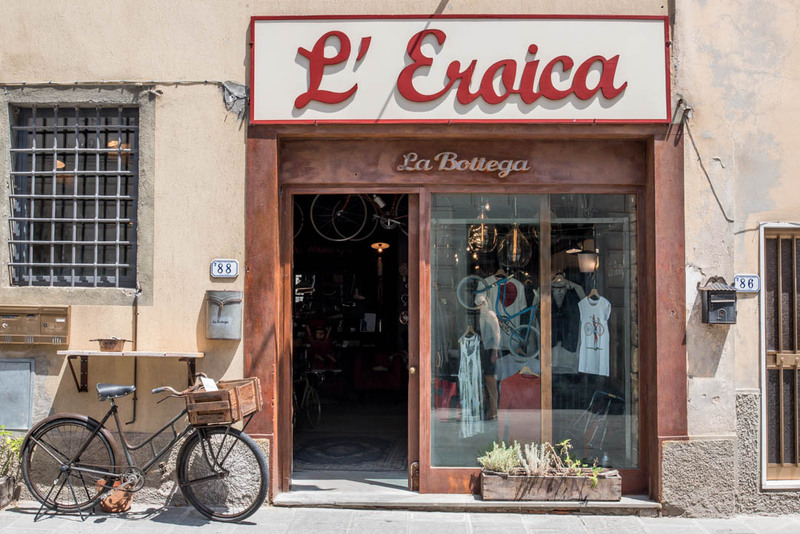 We salute the organisers of the Eroica and wish them all the best going forward! One of the brilliant things about traveling is seeing details you might not have noticed, or been bothered about in your own area. Take this old road sign, built into this building. It points the way to Siena, Gaiole and Radda. If this were in Britain we probably wouldn’t have taken notice. But because this is someplace completely new to us we stopped the car, looked up and took the shot. This sign has been replaced by modern signs and it will likely not be there in the future. This image captures a little piece of history in this area. Details: Nikon D750, Nikon 18-35mm G lens, B+W F-Pro Circular Polarizer. Exif: ISO 560, f11, 1/125 sec. 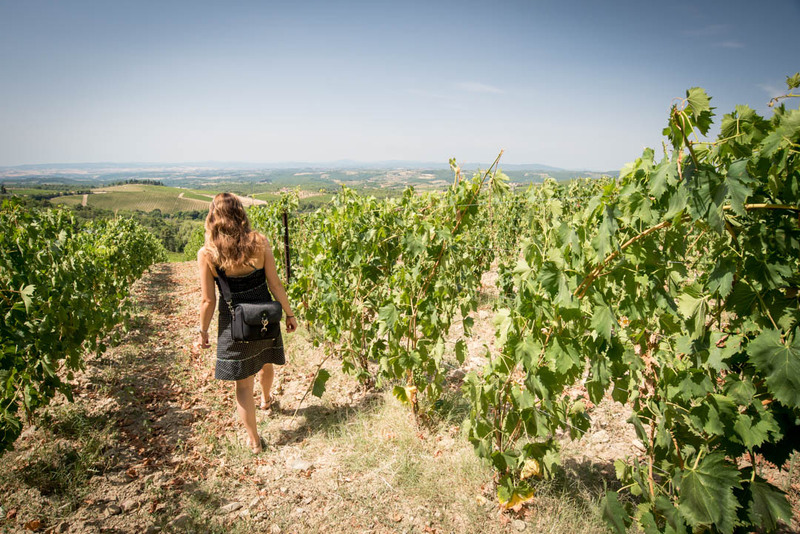 We spent some time meandering the ancient vineyards of Castello Di Brolio. The oldest winery in Italy, where the recipe for Chianti Classico was developed by Baron Ricasoli in 1872, is also the home to the fourth oldest company on Earth. Details: Nikon D750, Nikon 18-35mm G lens, B+W F-Pro Circular Polarizer. Exif: ISO 200, f8, 1/200 sec. 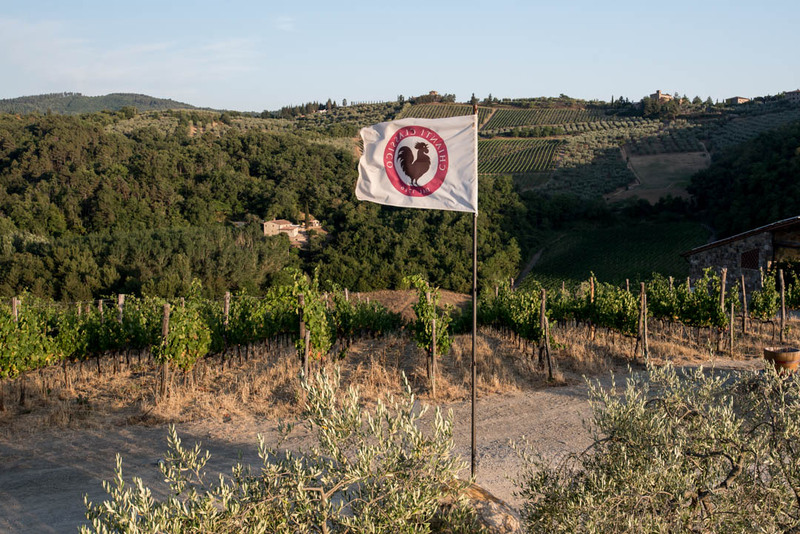 The Chianti Classico flag blowing in the wind on a hillside in Gaiole in Chianti. There are few places in this world more beautiful than Tuscany and the Chianti region. It is a photographic dream that every photographer should experience. Details: Nikon D750, Nikon 18-35mm G lens, B+W F-Pro Circular Polarizer. Exif: ISO 320, f8, 1/125 sec. 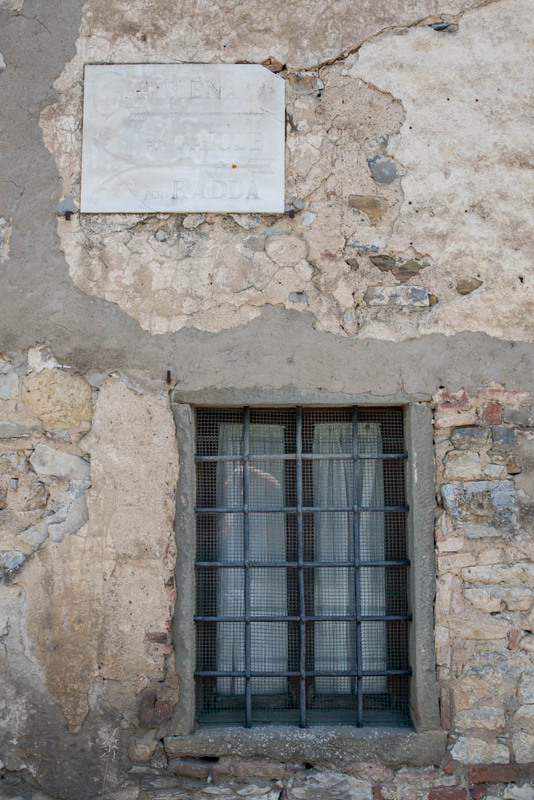 We hope you enjoyed reading about our little Italian adventure. As always, we learned a lot from this trip and will use that knowledge to continue to develop the best camera bags and leather camera straps we possibly can. And maybe a few other things as well. At Hawkesmill we try to never stand still. We are always looking at ways to either improve a photography product that is already in existence, or to create one ourselves. Traveling gives us the food for thought we need in order to do that. 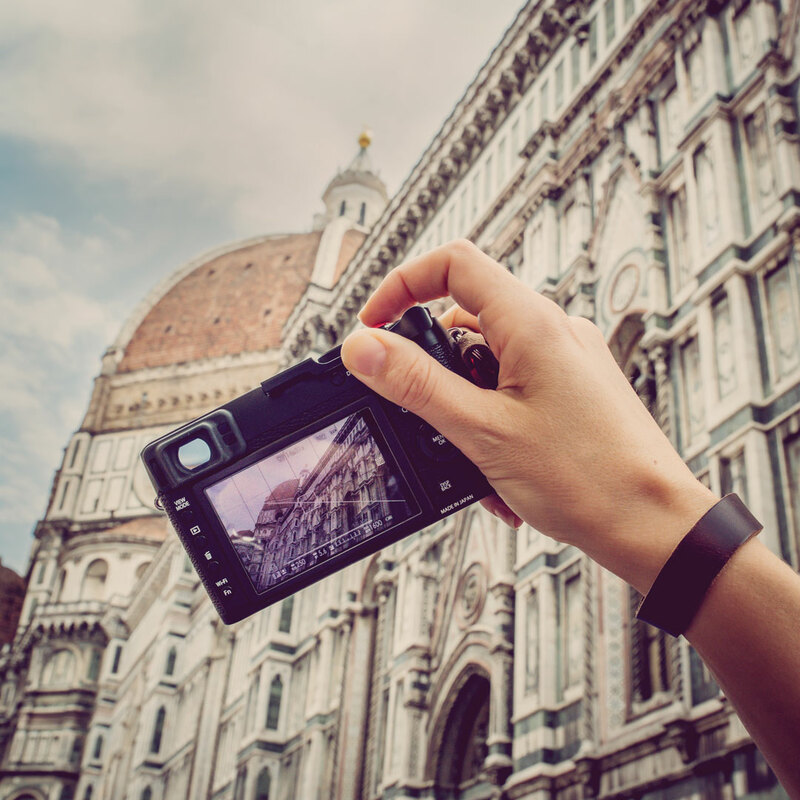 After all, most photographers use their equipment especially for traveling and travel photography, or travel with their camera gear to other places. It’s vital for us to understand our existing products and our future products in all areas of photography, not just weddings, portraits, etc. Being photographers ourselves, we feel this puts us in a good position to be able to develop the products we know other photographers want. And although some of our products are more niche, luxury products, we plan on developing products for every photographer. If you have any questions or comments please feel free to pop them down below. We love hearing feedback from our customers, potential customers, or just those who found this by accident. This entry was posted in Camera Straps, Travel and tagged Fujifilm X100T, Italy, Leather Camera Straps, Nikon D750, Travel.